When I was a little girl, my parents took us to a restaurant in Baldwin called Raay-Nor’s for a deep fried dinner. 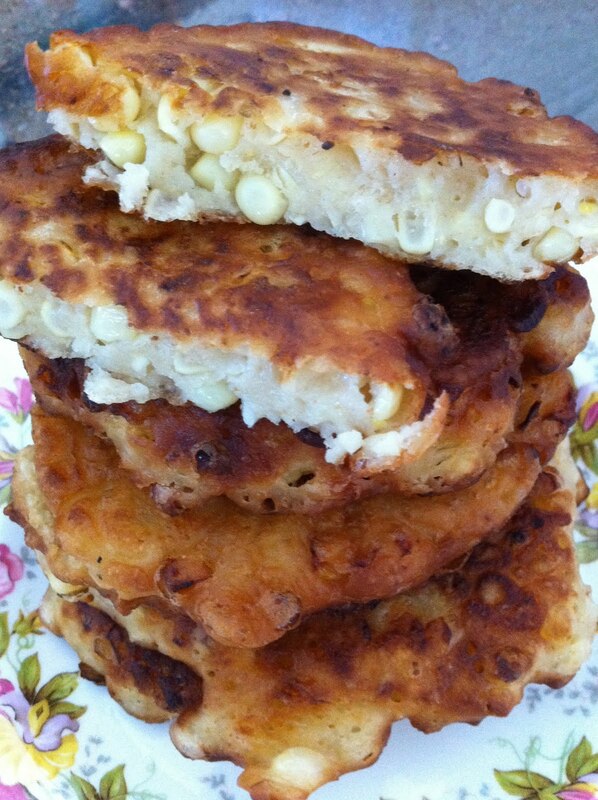 My favorite: corn fritters. I have not been there in over 20 years but the memory of those fritters lingers. With all of this summer corn, I decided to create my own recipe. I must say, I did a great job! Heat up a skillet with sunflower oil. Using a 1/4 cup measure (this makes about 9 nice sized fritters), pour the fritters in and let them fry up. Yes, we are frying here! Be careful and don’t let the oil get too too hot because the corn can start to pop and fly out of the skillet! When there are little bubbles on the top side, flip them over (kind of like pancakes) and let the other side brown. Drain on paper towels before serving. Enjoy!